Aloha! Hawaii is a great place for families but our pick is a fabulous best friend destination. Hawaiian Airlines is our carrier of choice for direct flights from Brisbane. The service is great, relaxed, and has good in-flight movies and in no time (13 hours or so) you are there. The weather is wonderful all year round. Mid to high 80’s in summer and upper 70’s to low 80’s if you think that’s cooler. 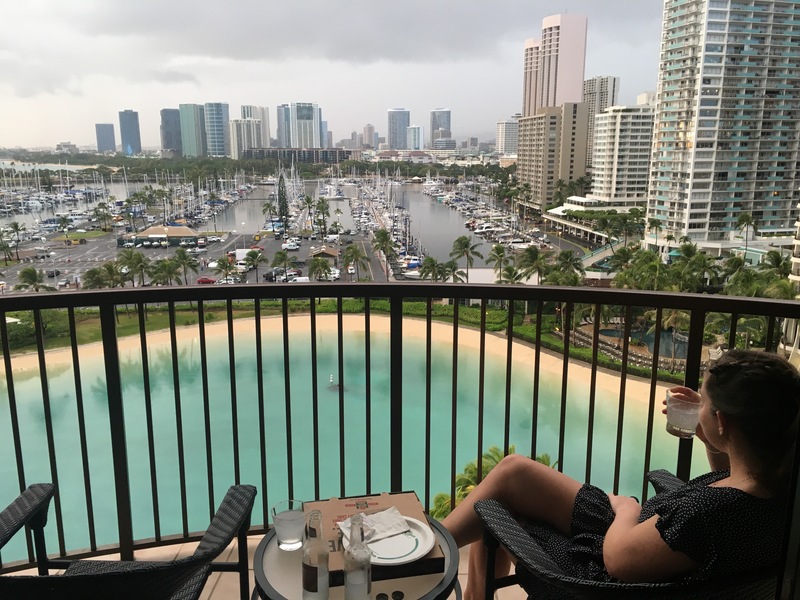 If budget permits, and even if it doesn’t, the Moana Surfrider is the only place to stay in Waikiki. One of the original Hotels on the Island, it is a beautifully restored colonial-style vision in white right on the sand in the middle of town. All marble and pillars and positively amazing. Wrap around terraces, bar and dining areas and the most amazing tree which takes centre stage as you head to the pool, beach bar and beach. Recommended daily routine is an early breakfast, morning on the beach, G and T’s to welcome lunch at the beach bar and some exploring. Be aware of the generosity of US portion sizes. Breakfast – grab the night before from the one of the many ABC store – a convenience come everything shop from yoghurt to t-shirts to gin. Dinner – to find somewhere to have dinner ask the locals. There are many great places in the upper levels of the Main Street and also great food at the hotels’ beach bar. 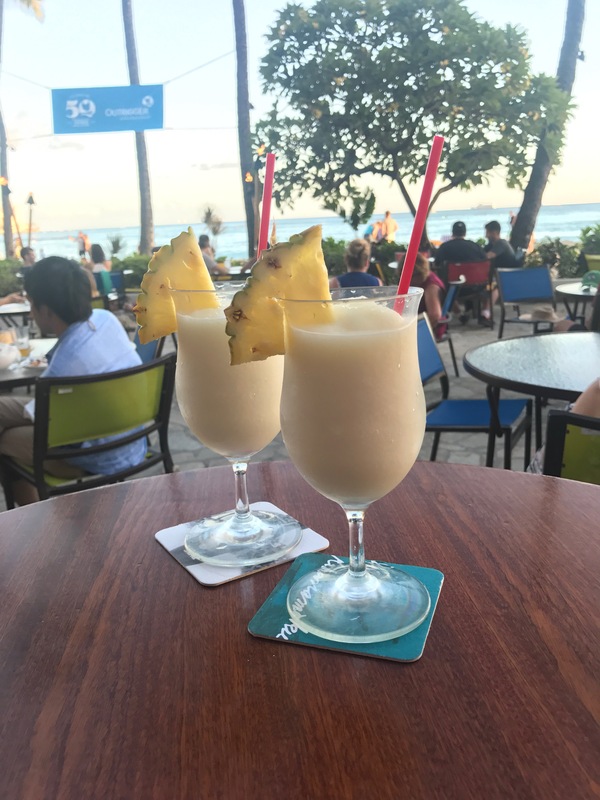 If you’re having FOMO check out our Healthy Pina Colada recipe. My biggest piece of advice for any Hawaiian newbies is to pack light! Thow in some swimmers and a beach dress and you are good to go! We also recommend the TOSKA Active towel, as it is light and 4 x smaller than the average towel giving you more room for extra shopping! Without going into too much detail, hit the beach early as it can get crowded and very hot later in the day. 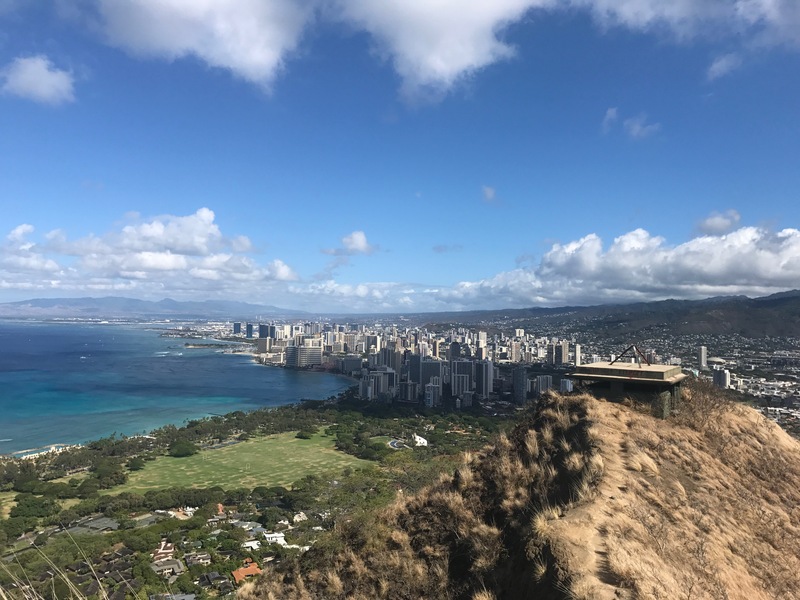 Diamond Head is a good morning activity. Don’t walk there as once you get there the hike within the crater to the top is not a walk in the park. Again do it early to beat the queues and the heat but a great view and sense of sweaty achievement. Pearl Harbour is overwhelming but in a good way. A very moving and humbling experience. So well thought out and executed and a definite must do. Do get there early, say 7.30 and join the queue but it does move fast once inside. An uber will set you back around $40 US and a bus back around $5. Allow the morning to see all the sights. And for something moving in a vastly different way, the sunset catamaran cocktail cruise is a must. Moored outside Moana, book with the boys on the beach during the day and meet around 5 to head out to sea. The sunset is incredible and looking back at Waikiki as it twinkled alight was stunning. If shopping is on your list the Waikele Premium Outlets is accessed by shuttle buses from Waikiki. Allow at least 2 to 3 hours once there depending on your stamina. You can also find some great buys in Macy’s at Waikiki, Sephora and Victoria’s Secret so have a look there as well. A two hour or so drive will take you to Turtle Bay, a beautiful location on the top of the island where turtles really do hang out in numbers. You can hire gear and get amongst it at the main viewing beach but be prepared for sharing the experience with a truckload of people. Swim at a beach a bit further up for a bit of privacy. You can also stay in the area with The Turtle Bay Resort a great choice. Great pool, lagoon swimming area (also open to the public) and a fabulous beach bar and restaurant. The best gin and tonics on the island! 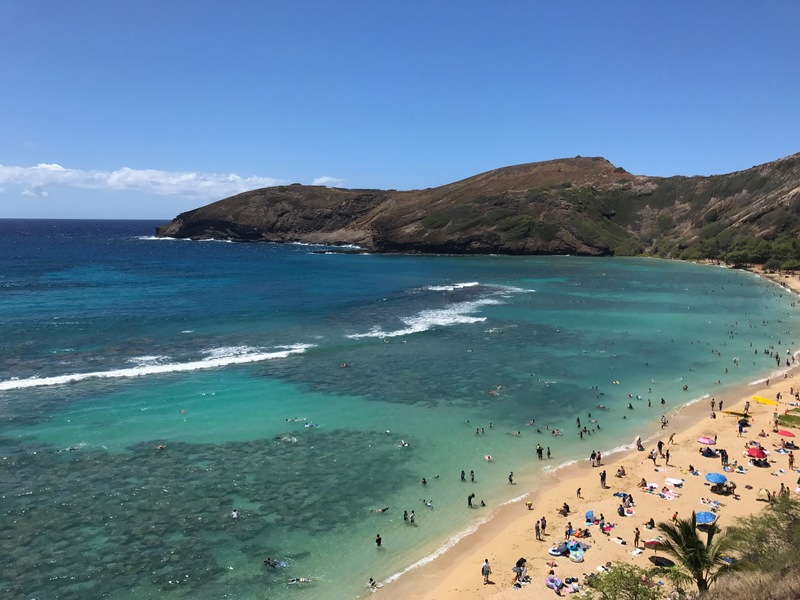 If you are short on time stick to Honolulu rather than island hopping but if time permits definitely head further afield, Maui looks to be amazing. This article was written and produced by Sherron Dalziel.